Helping others succeed by being a servant leader. Normally, I write about leadership, however, I felt the need to discuss a bit more on family and the loss of men who were fighting for our country. I ask that you also take the time to keep the families of these men in your thoughts and prayers. If I didn't have my two younger sisters, I know I wouldn't be an Uncle today nor would I be a Brother. Although sometimes, that is still debatable because for some families, its a title that doesn't hold any weight. 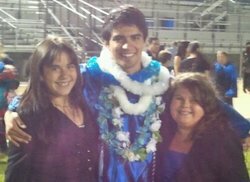 In this picture are my nephew and two nieces which are miracles for me today. I surely wouldn't have them either! My nephew turned 18 in December this past year and is part of the 2011 class. My oldest niece will be starting Junior next week and my youngest soon to follow in a few years. It's still hard to take that all in. As some of you have seen in a previous post, I am learning to take more time for family these days. I was unsure of what to even write tonight since I haven't written for a few days, but thanks to the Associate Pastor and Plinky having this question as a topic I was able to sort of mix in the lesson and give an answer. I think that if I grew up as an only child, I might have been more messed up. I wouldn't have had to fight for my parents love and affection. Although, I think that I get more from my Mom, whereas my middle sister gets more from Dad. But isn't that how it usually is? I sure did learn how to share by the time I got to Kindergarten. I can remember some kids who cried for hours because they were told that they had to share their toys! But I guess growing up alone has its plus and minuses. I wouldn't have had to share a bedroom back in preschool through first grade. I wouldn't have had to share a bathroom like I did in high school! I wouldn't have had a resentment against my sister because she was actually better in sports than I was. Wow, 25 years later, and I am saying this publicly! Who knows, I might not have been the alcoholic that I became over the past 17 years either then again, it was in our family history. Some of them are just functioning alcoholics. The one skill that I could never master! However, some of you will find in my about me section that I have stopped drinking. I am truly glad that I didn't grow up as an only child! I am grateful for the experiences that I have had in my past. I accepted Christ into my heart back in January this past year and now go to a church that accepts us broken people. Some of you might be familiar with Luke 19:1-10, the story of Zacchaeus. I remember hearing about this while going to Catechism before getting my First Communion. I didn't quite understand it 30 years ago, but am glad to have it told to me again and learn that God's table is for the lost and those who seek and find Him. Please remember to say a prayer for their families. Don't be afraid to even say a prayer on Facebook for them to help spread the news about losing some soldiers who fought for our country. Remember that the dash in between your birthday and your death on the tombstone, isn't that long. We can either make life worth living or let life live us. Which do you chose? I am an online marketer who teaches others through servant leadership.